You can register your company by filling out the registration form. You can choose between a single vacancy, vacancy package or internship manager. After your registration you can easily place an internship or graduation assignment on our website. Use our search engine to invite students to apply to your vacancy. Our system will match your placement to every student in our database. The system will automatically send an email to every intern who qualifies for your internship or graduation assignment. Students are invited to apply to your position when we email them. This is the best way of getting applications and targeting your target group. the automatic email that students receive from our system. 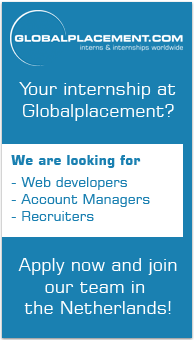 directly viewing your internship on our website. Your personal page offers an overview of all applications. Approve the application of a student. Reject the application of a student. With the vacancy package you can view the complete profile of every student that has applied to your internship vacancy or graduation assignment. With the internship manager package, your internship manager will provide you with complete student profiles according to your requirements. If you wish to read the requested profile in another language you can simply switch the language by clicking on a different language at the top of the page.